Isn’t she a beaut? Colorado River Day is recognized each year on July 25th. 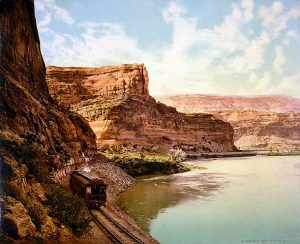 It was on this day in 1921 that Congress re-named the river from the “Grand” to the “Colorado.” 96 years later, the river flows 1,450 miles from Colorado to California. In and around her waters you can experience many recreational delights including rafting, kayaking, stand up paddle boarding, hiking, fishing, or simply dipping your toes in and admiring the gorgeous views. If you’re a nature geek like me, you probably feel just as tickled to have this iconic landmark running right through Mesa County’s backyard, supplying grand scenery and outdoor tourism opportunities. You can also visit the Central Library’s Raleigh History Room to find articles, photos, and geographical information including topography maps. Take a minute this week to enjoy and pay homage to the mighty Colorado!